Disclaimer: If you have not yet seen the film, The Green Mile, and continue reading this post, you will encounter some spoilers. 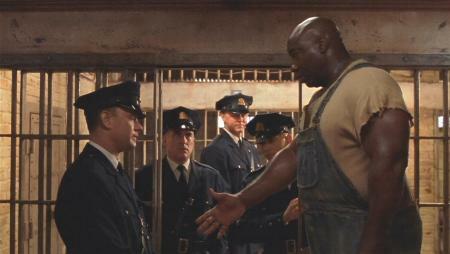 The Green Mile is where we meet this unlikely theologian. When John enters the prison, he towers over everyone not only as a tall man but also as a convicted murderer. Along with the guards, we get to know him, and we realize this man is the opposite of a monster. He is gentle and respectful. He has a strange and powerful gift of healing. He lands on death row because he was in the wrong place at the wrong time with right intentions—trying to save those he is accused of murdering. The guards’ eyes open to who John really is as he reveals who really committed the crime. They witness him deliver an ailing woman from her illness. They come face to face with their devastating responsibility: they have insufficient evidence to save John from the electric chair. On the eve of the execution, one of the guards, Paul, offers to help John escape. He declines. Paul struggles, his conscience in turmoil. John responds…. Last week was full of ugliness in our nation. It began with the discovery of bombs targeting a specific political group. It ended with the deaths of 11 Jews in their house of worship at the hands of anti-Semitism. A news alert about the shooting at Tree of Life synagogue arrived on my desktop as I typed a paper about the psalms of lament. Lament filled the room. Tagged to the tears of King David and the questions of Korah’s sons were the wearied words of John Coffey. Tired of bullets shattering us from unity into pieces of glass…. Of course, you understand, Lord…. We need John Coffey’s lament as a nation. From lament we repent. From repentance we receive new life. From new life we walk forward filled with God’s Spirit to live differently. After Paul walked John down that green mile, he quit participating in executions. He changed. He chose to live differently and well, forever changed by the healing gift he experienced in John and wished to share with the world.